The Governor's Arts Award in 2007 - Click here. Catch a glimpse of me on YouTube - Click here. A link to a Nevada Appeal article reprinted in ejazznews - click here. A link to a 2004 article speaking favorably about our press releases - click here. I have to admit that I have a great publicist, my wife Ellie! 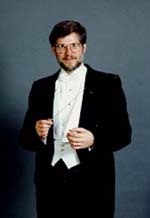 A link to a late 2005 Columbia University News Service articles about volunteer orchestras - click here. Tuesday night's Mile High Jazz Band concert was standing room only as the band was joined by local poets reading their works. Comma Coffee isn't really the kind of place one thinks of as a site for a heavy assault by a swing band, but it works out perfectly, creating a sort of front-parlor setting like a family clustered around a piano. Jakki Ford of Reno joined in with some fine songs, including "Back in Your Own Backyard. " Closing tune for first set was "Blues in Hoss Flat," by Frank Foster and Count Basie. Super soloists were Dean Carter, trombone, and JoJo Shelley, tenor sax. David Bugli conducted in his casual manner, and the bands section work was as precise as that of Count Basie. Your Mark Twain piece was a HIT at the concert. We closed the first half with it. I wish you could have been there. The audience was absolutely rivotted to the interplay between dialogue and your charming themes. We got many happy chuckles from the laughing points, and a lively applause at the end. ...[I]t was very successful, and was definitely an audience favorite that evening. Thank you for letting us use it! I completely intended to write to you soon after Spirit and time got away from me. In any case, many thanks for an excellent arrangement of Las Chiapanecas. It worked very well and, given the limited rehearsal time we always have for Spirit, I appreciated the carefully edited and easy-to-read parts you provided us. Thanks again! We absolutely may use it again so thanks for letting us hang on to the music. About a month or so ago I received a call from Gary Cain of the Carson City Historical Society, asking if I might be interested in presenting "Christmas with Mark Twain" at the Bliss Mansion. I was honored that he would ask but told him that Mark Twain would be more interested in New Year's Eve than Christmas, and if he had something along those lines I would be in up to the nubs. Gary, not discouraged, advised me that David Bugli, the famous Carson City composer and symphony director, had composed some original music that would give wings to Twain's words, and that was not all. Guy Rocha, Nevada's Rock-Star Archivist-Emeritus would be there to hold forth in an attempt to keep Mark Twain from wandering too far from the frozen truth. Well how could I say no to that, so on Sunday evening we convened with 75 spirited citizens in the cozy confines of Bliss Mansion, where our gracious hostess, Cindy Brenneman took us on a tour of the home. What a spread. The entire third story was once a dance floor. And they mixed goat hair in with grout to make the heavy wallpaper stick to the ceiling, I know not why. Dinner was divine, and then it came time for "Becoming Mark Twain," which David and I had presented in Carson and Fallon with a full orchestra, but had not had occasion to practice as a duo. This presented an odious problem. David used to cue me with his baton, but now his hands were tied to the piano, and if he looked up to cue me with his eyes he would never be able to find his place on the sheet music again, so he had to cue me by blinking his eyes, which meant he could not blink his eyes without cuing me. Well this put an awkward strain upon both of us that must have been obvious to the audience, but they seemed to sense the delicateness of the situation and gave us a round of applause when this torture was finally over. We then agreed that next time David would wear a single feather like Tonto, and tilt his head forward to signal the Lone Ranger to speak. Then Guy Rocha stepped onto the platform and the evening got warmer yet for me. Guy is Nevada's myth buster, and I love to follow Guy in a program, because then I don't have to damage my constitution with the truth, for he has already exhausted it. But on this particular occasion, Guy was there to debate the veracity of certain Carson City historical events that I speak to on occasion with total reckless abandon. Well, Guy, some call him Rex Veritas, was of a good humor, and in the spirit of Christmas chose to handle me with kid gloves. I only wished I had slipped a little brandy into his coffee and I might have come up winners in our debate. But all in all, it was the most cordial and sociable evening of the season that I have had the pleasure of attending. Oh, and I should confess before closing, that in the mock trial I attended this week in a Phoenix courtroom to determine if Mark Twain published racist materials, I was found guilty by the Deer Valley AP English kids. When Judge McVey announced the verdict, well, you could have put a ham in my mouth without my noticin'. So I'm on probation now, with court instructions to write a book to uplift humanity -which I shall begin tonight. --- McAvoy Layne is an Incline Village resident who visits area schools as the ghost of Mark Twain. Learn more at ghostoftwain.com. Send me your comments from this page.